NBA Live, a $10 game from EA Sports, continues EA’s march to port all its major sports titles (Madden, Tiger Woods, FIFA) to the iPhone. You might think it could be tough to slim down all the gameplay elements of a feature-rich console title like NBA Live so that they work on the iPhone’s small, multi-touch screen. NBA Live is a bit of a hodgepodge, mixing elements of awesomeness with assorted weaknesses that detract from the rest of the game. Even with its glitches, though, the game is copiously detailed and great fun to play. The good points in NBA Live are numerous: First off, it’s exceedingly detailed. Every team is represented, with all the players you know and loathe love, and each team’s stadium is available, too. The gameplay graphics are about on par with EA’s other action sports titles, which is to say—not stellar, but certainly passable, and better than you ever thought you’d see on a cell phone sports title. The replay cut-scenes, on the other hand, look pretty amazing. I’ve long been a video-game-replay-skipper, but NBA Live’s are impressive enough that I generally watch—assuming I didn’t just get dunked on. After making sweet shots, you’ll see players celebrate or charge up the crowd. It’s (Mostly) Faaaaaaaaaantastic: Despite some rough edges, the graphics of NBA Live capture the frenetic pace of the NBA fairly well. The controls in NBA Live are less impressive. 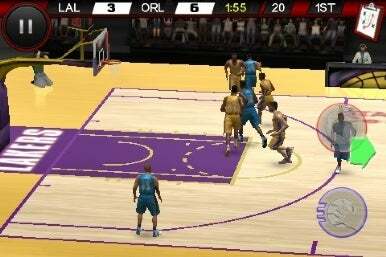 Porting button and d-pad controls to iPhone-friendly alternatives presents a tough task for game developers, and NBA Live’s solution is mediocre at best. The d-pad works well; you can essentially plant your thumb anywhere on the left side of the screen and move it in the direction you desire. But the virtual buttons on the right side of the screen are decidedly less satisfying. Offensive controls work okay, with one button for passing and other for shooting. Two tutorials help you master these controls, which can be lightly tapped (for a pump fake) or swiped for slick jukes and other maneuvers. Defensive controls are disappointingly even muddier. Two buttons are meant to cover switching players, attempting to steal, blocking shots, rebounding, and more. Even with practice, defense too frequently felt like an exercise in (virtual) button mashing, more than strategic maneuvering. My teams averaged merely two steals per game. Aggressively staying in the face of offensive players was my best defensive bet, often triggering a shot-clock penalty while my opponents waited for a clearer lane. Madden NFL 10’s slow-motion buttons—and the fact that it features more than just two buttons at a time—seem like perfect features to bring to NBA Live, but they’re just not there. In both rookie and intermediate modes, it felt a bit too easy on offense to simply charge across the court to the basket for a dunk—literally running through any players in my way. The lack of collision detection on players make sense given the cramped quarters, but it’s still jarring and feels odd. Foul shots use the accelerometer: You tilt the iPhone back and then forward to arch your shot. It would be a clever implementation if it required a bit more effort; I’ve yet to miss one—even when shooting as Shaq, a notorious bricklayer from the charity stripe. Occasionally, I encountered some brutal frame-rate issues, even on my iPhone 3GS. Relaunching the app—or just waiting it out for 5 to 10 seconds—would generally resolve the problem. On the audio front, the game features a driving soundtrack, though the sound effects and commentary are pretty repetitive. I am especially tired of hearing some kid yell “C’mon guys, let’s go!” incessantly during the game. The game’s menus are ugly and out-of-place on the iPhone, but they do have plenty of options to guide you through—exhibition, season, or playoff games, three levels of difficulty, three levels of penalty enforcement, quarter length adjustment, and so on. So NBA Live isn’t perfect. But it’s undeniable fun and highly replayable, in spite of its flaws.